In addition to the usual fun factor of Mario, the reviewer felt that the new hat actions and capture abilities are fresh. He was getting well used to the two-handed controls that make good use of the Joy-Con’s gyro feature. Also noted in the review, each stage is full of discoveries and surprises. The world with its realistic touch, which is unlike anything before, had quite an impact on the person playing the game, and feels this will make you want to continue your journey to new locations. The second reviewer noted how the levels are created in such a way that makes them very worth exploring, so it’s great to see them full of discoveries and surprises. 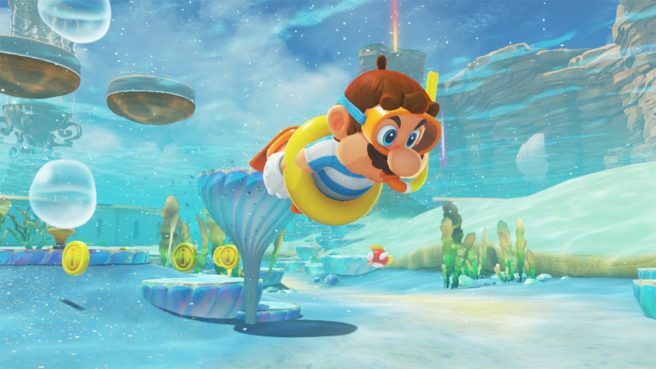 The various gimmicks ensure that players won’t be bored, and will make them want to run to every corner, finding Power Moons and coins from each area. The actions that use the cap are said to be fresh, and being able to control various characters with the capture mechanic is also interesting. The reviewer also highlighted the help mode and two-player multiplayer, so you can play it without worry. The new hat throwing action is like a boomerang, and it also has good compatibility with the Joy-Con controls. This person felt that it’s fun to open new unexpected breakthrough doors by capturing enemies and animals. Various tricks are hidden in areas in each kingdom, so exploring is interesting and a lot of gimmicks can also be fathomed. The NES-style 2D areas that make good use of the walls are also original. The reviewer is also glad that Super Mario Odyssey can be played for a long time thanks to features that are unlocked after clearing the game. According to the reviewer, Super Mario Odyssey has a great composition full of exciting elements that make you feel like experiencing a good-quality journey. Gimmicks from Mario’s costume changing, hat-throwing attacks, to capturing enemies and transforming are fresh for the series. But rather than showing off strange things, it still retains the play sensation of a Mario game. The reviewer had one word for the game balance that has both senses of comfort and originality: excellent. The map design that lets you enjoy even the corners inside the sandbox is also great.